As part of our educational outreach efforts, ICARE hosts an hour-long monthly web-based genetics case conference. 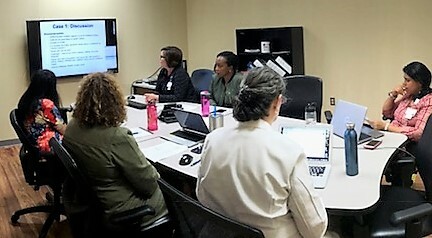 Providers from across the country who recruit high-risk patients to ICARE regularly attend and present cases for discussion. May 2017 – Case conference focused on CHEK2 heterozygotes. June 2017 – Case conference focused on PALB2 cases with guest experts Drs. Marc Tischkowitz and Kelly Metcalfe. Who can access ICARE genetics case conferences? *Exceptions may be made on a case-by-case basis for providers who are unable to recruit to ICARE due to institutional constraints, but actively participate in/contribute to case conferences. *Focus may change due to unforeseen circumstances. If there is a change in the focus, ICARE partners will be notified.